The CERT concept dates back to 1985, when the Los Angeles Fire Department recognized that in the early stages of a disaster - earthquakes in particular - local emergency responders would be overwhelmed, and basic training in disaster survival and rescue skills would improve the ability of community members to survive until responders or other assistance arrived. Recognizing the universal value of this program, the Federal Emergency Management Agency (FEMA) worked in conjunction with the LAFD to make the CERT program applicable to all types of hazards and developed a CERT training program which could be used nationwide and adapted to meet local conditions when the need arose. The tragic events of September 11 remind us that disaster can strike anywhere or anytime, and that basic safety and disaster survival skills can mean the difference between life and death. CERT training empowers community members to prepare responsibly and respond appropriately when emergencies occur. CERT training promotes a partnering effort between emergency services and the people they serve. 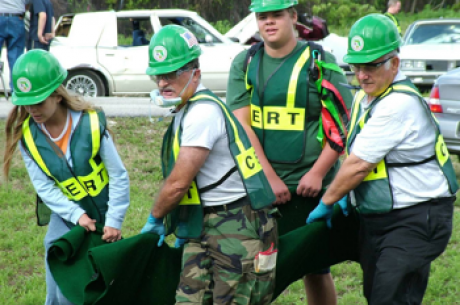 CERT members give critical support to first responders in emergencies, provide immediate assistance to victims, organize spontaneous volunteers at a disaster site, and collect disaster intelligence to support first responder efforts. The goal is for emergency personnel to train members of neighborhoods, community organizations or workplaces in basic response skills. CERT members are then integrated into the emergency response capability for their area. If a disastrous event overwhelms or delays the community’s professional response, CERT members can assist others by applying the basic response and organizational skills that they learned during training. These skills can help save and sustain lives following a disaster until help arrives. CERT skills also apply to daily emergencies. Total training is usually about 20 hours, scheduled in 2-4 hour modules, over a period of weeks or months, in order to address the scheduling needs of team members. It's held in the community or county where you live. Training courses, student materials and equipment are provided free of charge. For more information; contact the Division of Emergency Management's CERT Program Manager at 410-535-1600 x2302.